Committed to innovation & providing best in class corporate governance and responsible investment solutions. 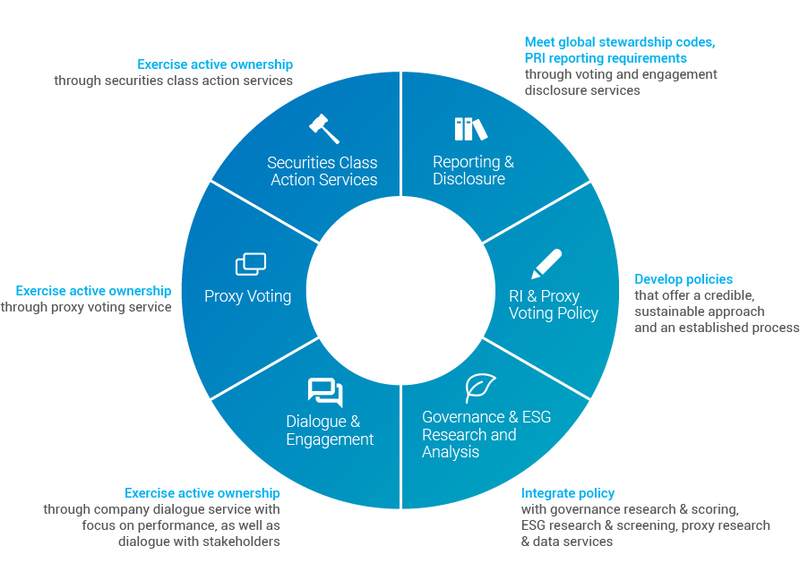 ISS uniquely delivers comprehensive solutions that enable institutional investors to apply their corporate governance views, identify environmental, social and governance risk, and manage their complete proxy voting needs on a global basis. With more than three decades of experience and the global resources to help more than 1600 clients understand governance issues, ISS has been – and continues to be – the preferred choice among asset managers, asset owners and hedge funds. Support investment decision-making using global data and analytics, covering director, compensation, voting records and meeting results, and ISS Governance QualityScore. Develop and integrate responsible investing policies and practices into your strategy, research, analyze and screen for company performance, and support engagement and communication. Leading research, proven voting and disclosure services, and advanced ProxyExchange platform allow you to manage the entire voting process and flawlessly execute your mandates, season after proxy season. Turnkey securities class action services and RecoverMax platform to maximize recoveries from litigation settlements. ISS delivers a fully integrated solution to help you make informed decisions to support your investment strategy and meet your compliance needs.